Retired Army Staff Sgt. Drew Hill doesn’t sound like a guy who’s life needed saving. He’s confident and friendly, with that ingrained Army habit of calling you ‘Sir’, and he loves talking about hockey. “Chippy”, it turns out, is one of his favorite descriptions for just about everything. We spoke recently after he just got off the ice for practice at Kettler. 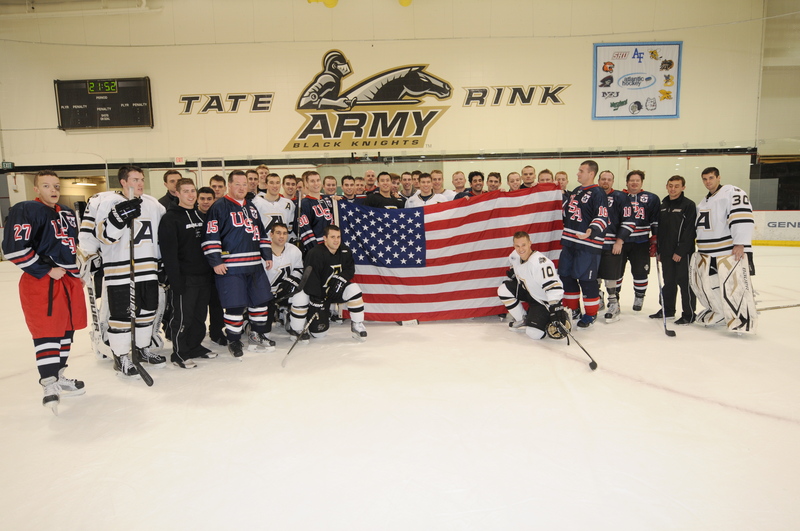 He was tired – “Sorry about being winded, Sir” he says – but eager to talk about his team of military pals who don skates as often as they can. Whether they have all their limbs or not. After all, they have a big game coming up. 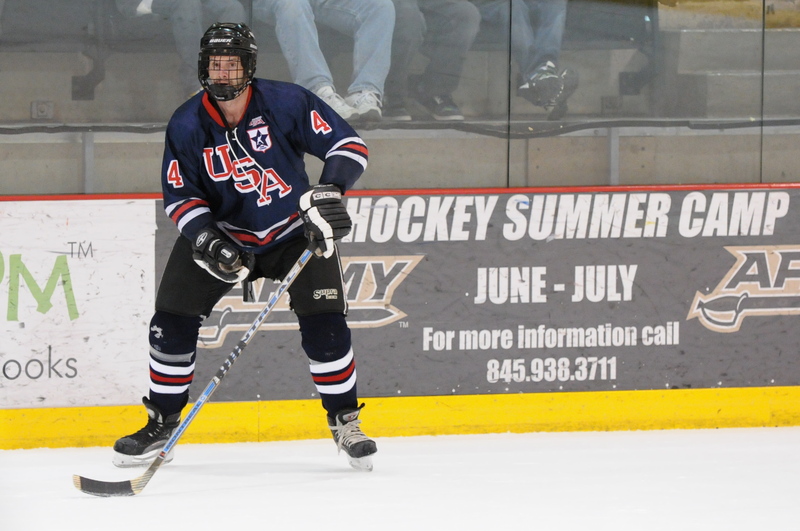 Hill is a member of USA Warriors Ice Hockey, a project of USA Hockey and the NHL, that gets wounded American combat veterans out on the ice, playing hockey, whether they’ve ever played before or not. In fighting, Hill’s right ankle was pretty much shattered and had to be completely rebuilt. “I’ve got titanium and all kinds of metal down there,” he says. Hill’s story is a familiar one to anyone who plays with – or knows of – Warriors Ice Hockey. Composed of wounded vets from Iraq and Afghanistan, it’s part exercise, part amateur league, and part therapy. And this Thursday at 7pm at Kettler, the puck will drop at Kettler on a big game – the Wounded Warriors vs. the Congressional hockey team. In this era of unending war, it’s still odd to see vets showing signs of battle. Other than the obligatory standing ovation at a Caps game for a minute or so, members of the military – especially the wounded – can seem separate. Segregated, perhaps, by a country that values their work, but has fraying connection to armed service. But when the Warriors play, nothing is separate. Every player is on the ice – but only some of the scars are visible. Vaccaro grew up in Buffalo, something of a two-horse town when it comes to sports. “In Buffalo, you either play football or hockey. We went down the hockey road,” he says. His father worked for the Buffalo Sabres. A civilian employee of the Army Corps of Engineers and a staff sergeant with the U.S. Army Reserves, Vaccaro is also currently the coach of the Maryland Sabres, a club which sports teams of Mites, Squirts, Bantams and anyone else young who wants to play. And it turns out, among those who most want to play is Vaccaro. Vaccaro was fortunate – relatively. He took shrapnel to the face, had some damage to his teeth and jaw. Five years on, he’s pretty much healed: people often assume he was never wounded, he says. But Vaccaro – like Hill – needed something more, so he got involved with the Warriors. And, like Hill, when Vaccaro talks about hockey, it’s in near-equal measures of competition and therapy. The current Army recruiting slogan calls it “Army Strong:” you don’t quit, you don’t ask if you can do something, you just do it. 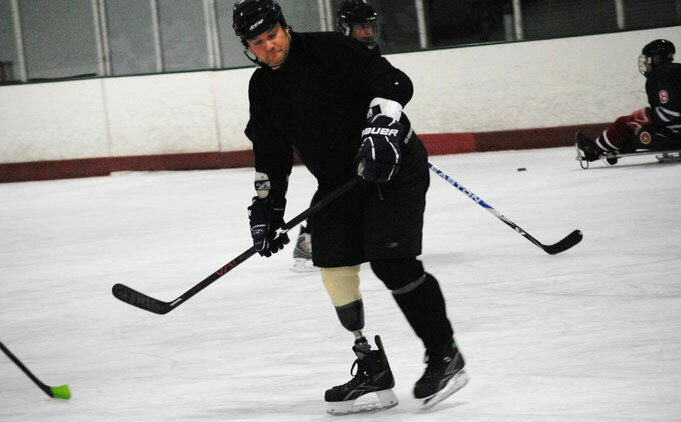 That training, says Vaccaro, is exactly what helps wounded vets struggling with their physical and emotional challenges find the courage to do something as seemingly nuts as strapping on skates and hitting the ice. This Thursday’s game is a fundraiser for the group – but it’s also a chance for some pretty competitive guys to take a shot at winning a game. In the past the Warriors have played a variety of teams, some of them pretty good…undoubtedly better than the Congressional team. And woe be unto the opponent who figures to ‘go easy’ on the Warriors. It doesn’t take long to figure out that this is a group of guys who want to play hard. “Id rather play with these guys than anyone else in the world,” says Hill, a natural center who plays a variety of spots during a game. What’s not been at all hilarious – except, perhaps for the scamps at Wonkette – is the small-minded bickering that pushed President Obama’s address to 7pm Thursday evening; the same time as the Warriors/Congressional match-up. For several days confusion reigned (just as it everywhere else in Washington it seems) about whether the game would happen. Late last week the Warriors decided: they’re too far into this, and they intend to hit the ice for puck drop at 7. What the members of the Congressional team do is still murky. But if bets had to be placed, you’d get good odds that staffers will replace those members who feel they need to attend the President’s address – and there will be a game. If you want stale, pie-fight politics, tune in C-SPAN Thursday night. But if you want to see some great hockey, played by an amazing team who’ve earned the title ‘warriors’, make a date for Kettler. This entry was posted in Uncategorized and tagged guys who inspire us, USA Hockey, Wounded Warriors. Bookmark the permalink.